---ABOVE Three pieces of track equipment work together surfacing track: a ballast regulator, a Mark IV production tamper, and a chase tamper. ---ABOVE Although much of the maintenance work is done by machines, such as this undercutter, which require far fewer people do to more work than traditional manual maintenance methods, a track gang is still needed to operate the machines and ensure the job is done properly. 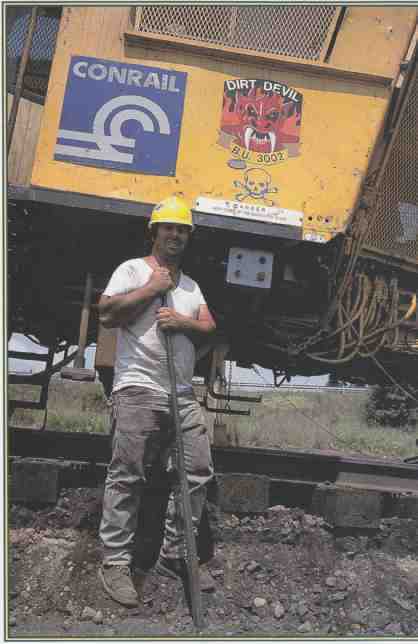 This guide is intended as an overview of rail way maintenance and the men and equipment that make it happen. My intention is to share my interest in why maintenance is needed, how the equipment works, what it does, and what it looks like. When I felt it was appropriate, I included background information about the people who in vented or designed equipment and maintenance processes, and a little bit of history about some of the manufacturers. Specific manufacturer’s equipment is described to provide real-life examples of the different types of maintenance machines it is not my intent to endorse one company’s product over another’s, nor do I intend to compare and contrast the virtues of different manufacturers. This text is not the forum for such critical analysis, and I have neither the level of expertise nor the interest to perform such a critique. Metal wheels pounding against metal rails inevitably takes its toll on a railroad’s track structure. Mother Nature, too, joins the assault, as heavy rains and fluctuating temperatures leave rails, ties, and the supporting ballast vulnerable to dangerous defects. Track weakened by these attacks can mean bumpy rides, or worse—deadly derailments. Locating and repairing such potential danger spots falls to a group of trained maintenance workers and their specialized machinery. Railway Maintenance: This guide explains and illustrates this essential but often ignored side of railway operation. Beginning with the defect-detection cars, from Sperry Rail Service’s yellow “doodlebugs” to modern track geometry cars, all railroads must monitor their lines for abnormalities in gauge, profile, or alignment. In some cases a defect is discovered that requires the deployment of a tie gang, with its parade of tie cranes, spike pullers, and other impressive machinery. 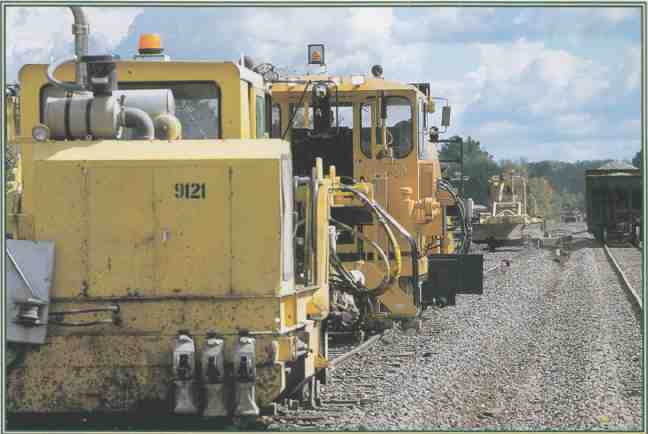 Laying and smoothing ballast along the tracks brings in the ballast regulators and tampers, in a variety of shapes and sizes. And who can help but be amazed by the awesome sight of a rail grinder traveling along the rails, sparks flying beneath it, or of a rotary plow blowing several feet of snow from the tracks in high mountain passes. Every stage of inspecting, maintaining, and repairing track and its components is described in glorious detail, offering an inspiring and informative portrayal of the work involved in keeping our railroads running. ---ABOVE: Gantry track-laying machines are often used to put new track down on railways overseas. 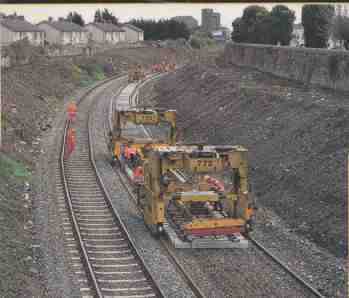 The old track on a section of larnród Eireann (Irish Rail) near Glasnevin in Dublin has been removed, the sub-ballast prepared, and welded rail laid out for the gantry to run on.